Are you guys ready for the heat?! 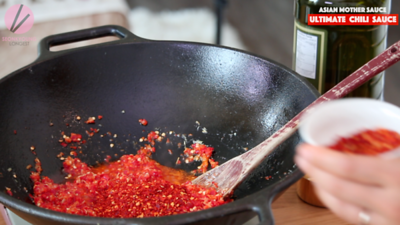 I brought to you, the Asian mother sauce, Easy Chili Sauce!! It can go on anything and everything you possibly can think! 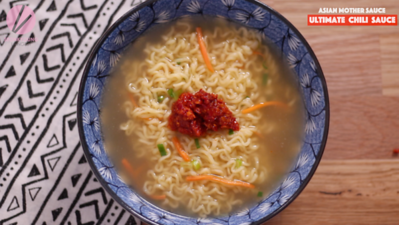 Spicy up your ramen or any noodles soups (or just any soup, even creamy soup! ), dress up the take out meals (fried rice, noodles, veggies, meats and etc) with a little dollop. 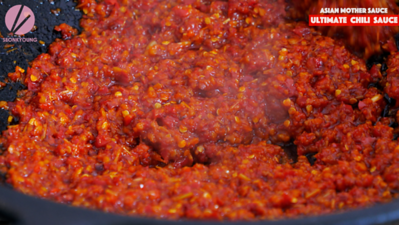 Heck, if your food is not as spicy and flavorful as you wanted, just add this easy chili sauce on! You will be in heaven. You’re welcome. 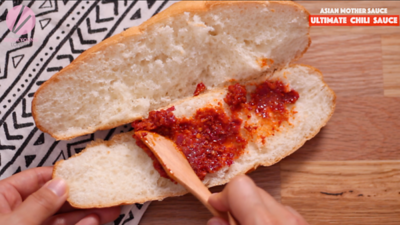 Oh, almost forgot to mention you can use this chili sauce as a spread on your cracker/bread, dipping sauce for any sausage, a bit on your sandwich… ah! So good! And it’s SO EASY to make at home! 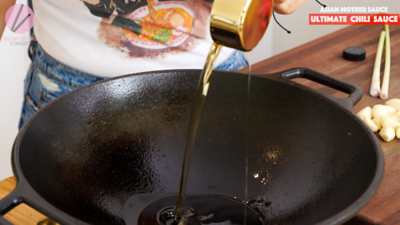 Heat oil in a wok or pan over low heat (if you’re using gas stove) to medium low (for electronic stove) heat. I used avocado oil, my recent favorite oil! You can also use vegetable oil, canola oil, sunflower oil or any light in color and flavor oil will do the job! 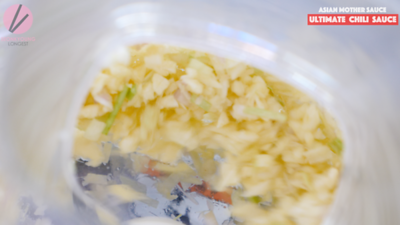 Meanwhile the oil is slowly heating up, quickly ground garlic and lemongrass in a food processor until fine chunks. If you can’t do this part quickly, go ahead and ready before the oil is heating up. 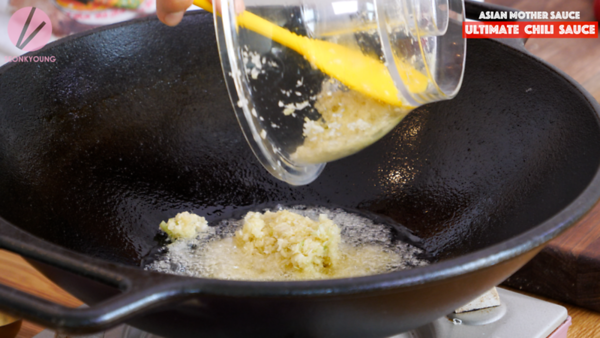 Add the garlic and lemongrass into the wok- the oil should be hot enough to bubble when garlic and lemongrass goes in but SHOULD NOT CHANGE THE COLOR of the garlic and lemongrass. 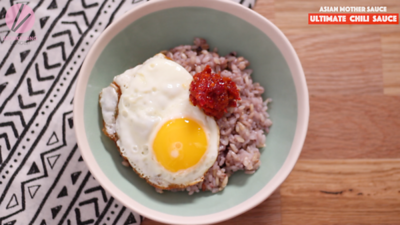 Low heat is the key point for this recipe! This is the wok I’m using for this recipe! It’s cast iron wok and it works the magic!! Cook the garlic and lemongrass for 5 to 7 minutes. Now, roughly chop red chilies 🌶 I’m using large Freznoes and a tiny bit of Thai chilies in red color. 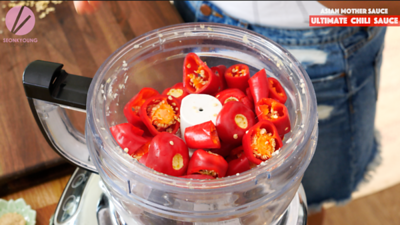 Ground red chilies and Thai chilis in the the food processor- size of red pepper flakes. Add fish sauce, palm sugar, gochugaru and chicken bouillon then stir well until everything is combined. You can use soy sauce instead of the fish sauce and omit the chicken bouillon if you want to make vegan/vegetarian. 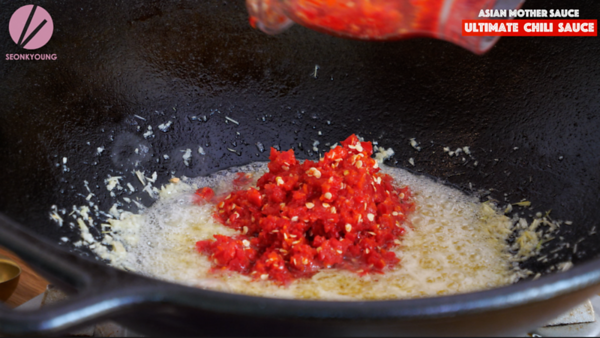 Now, cook the chili sauce for 10 minutes and stir occasionally. 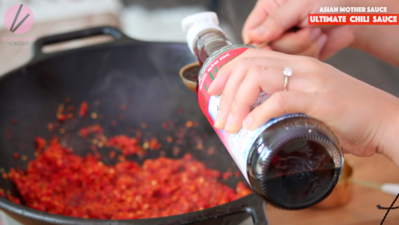 That’s it for this amazing Asian mother sauce, Ultimate Chili Sauce!! You can use this chili sauce pretty much on/in everything and anything. Soup, ramen, rice, noodles, spread, dipping sauce, toppings… endless!! 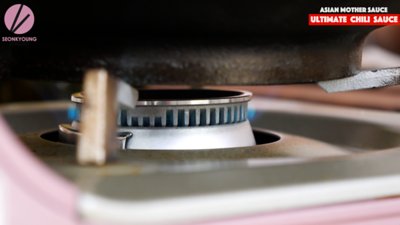 Heat oil in a wok or pan over low heat (if you’re using gas stove) to medium low (for electronic stove) heat. Ground garlic and lemongrass in a food processor until fine chunks. 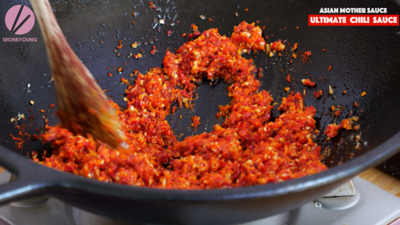 Stir into the wok and cook for 5 to 7 minutes. 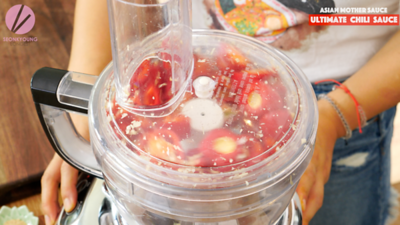 Now, ground red chilies and Thai chilis in the food processor- size of red pepper flakes. Stir into the wok. Add fish sauce, palm sugar, gochugaru and chicken bouillon then stir well until everything is combined. 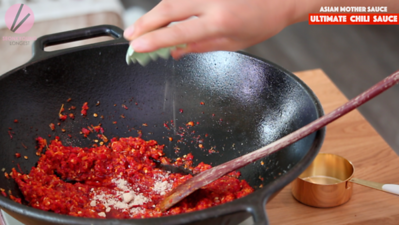 Now, cook the chili sauce for 10 minutes and stir occasionally. 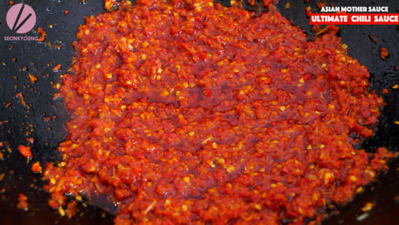 That’s it for this amazing Asian mother sauce, Ultimate Chili Sauce!! You can use this chili sauce pretty much on/in everything and anything. Soup, ramen, rice, noodles, spread, dipping sauce, toppings… endless!! This recipe looks absolutely amazing. I really want to make it tonight but I forgot to buy lemongrass. Is it ok if I leave it out?? Or maybe substitute it with something else?? You can leave out the lemongrass and just double up the garlic! Also, you can add a hint of ginger if you like! How long is the sauce good for? Can I make it in bulk and store for a month? 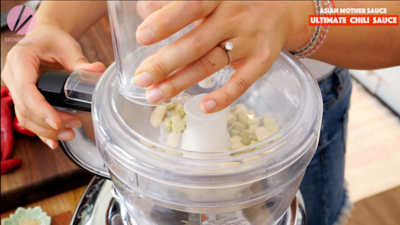 It will let 15 to 30 days in a fridge- just don’t eat straight from the jar! Human saliva will makes food go bad fast! Hi there! I am looking everywhere for the Freznoe peppers and I cannot find it anywhere. Would you mind sharing the place/places people would sell them? Thank you! I got them from my local Asian grocery, but you can also check at your farmers market too! 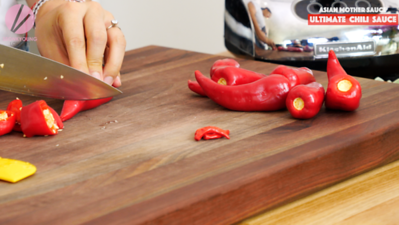 Fresno chilies are similar to jalapenos and usually less spicy. 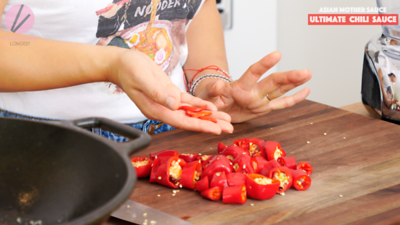 Red jalapenos may be easier to find in the stores. Jalapenos sold in Phoenix range from very mild to spicey, the heat levels are very inconsistent. Tasting before using is best in my opinion. Thanks Seonkyoung, this is one of my favorites.